The Flint Water Plant tower in Michigan is shown Jan. 13, 2016. 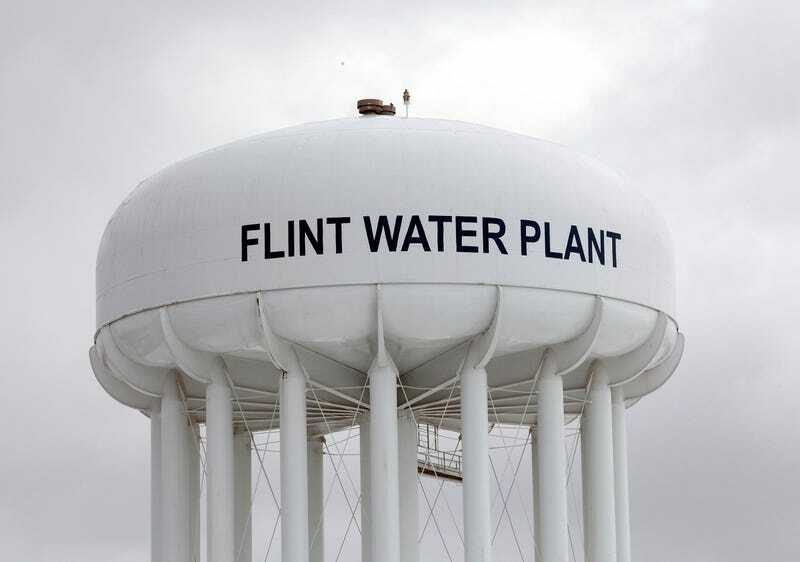 Two former state-appointed emergency managers, Darnell Earley and Gerald Ambrose, were charged Tuesday by Michigan's attorney general, Bill Schuette, over the tainted-water scandal in Flint, Mich., according to Talking Points Memo. The two were charged with four crimes, including conspiracy. Schuette said that Earley and Ambrose committed Flint to $85 million in bonds to help build a new water pipeline to Lake Huron. Apparently, at the same time, a city water plant was put in use that was not equipped to treat water properly from Flint River. Flint's water became lead-contaminated because the river water damaged the protective coating inside old pipes and fixtures. According to TPM, Schuette also charged Howard Croft and Daugherty Johnson, both former Flint city employees, with conspiracy and false pretenses. Schuette said that the water issue was a result of "arrogance, disdain and a failure of management." So far, 13 people have been charged in the investigation. "We are closer to the end than we are to the beginning," said Schuette.